Hi Party Girls! 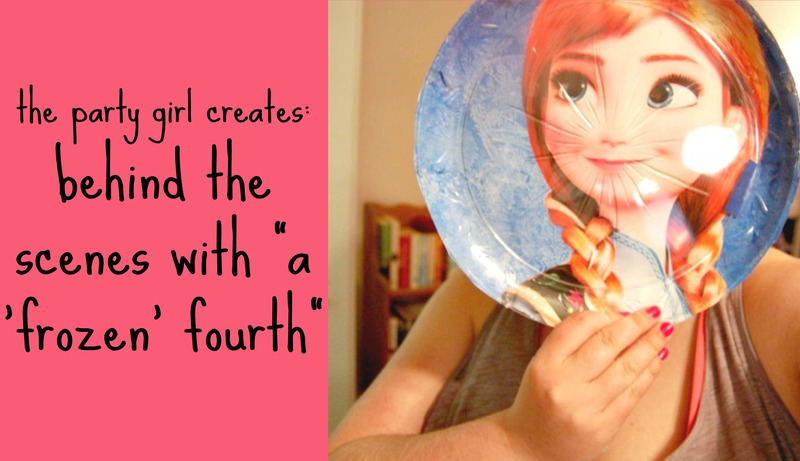 While Lauren’s Frozen party wasn’t the biggest we’ve worked on, it was one of the most diy-oriented on a super tight time schedule (we had about a week to plan, shop, and craft the whole thing), and that meant a lot of chaos. We thought it would be fun to dedicate today’s post to sharing some of the behind the scenes at The Party Girl, to see what it’s like to be us, and not just the styled, post-party edited photo version. So get prepared, it’s about to get messy! I admit, I have a super short attention span. That means it’s hard for me to make intricate snowman cookies and melted chocolate snowflake cupcake toppers with my undivided attention. I’d like to say I watched Frozen for ambiance, but actually I had a Veronica Mars marathon. Worth it. Icing containers. I found these guys at the dollar store and it was the best $2 I ever spent. It comes in the most handy when I’m flooding cookies in only a few different colours. 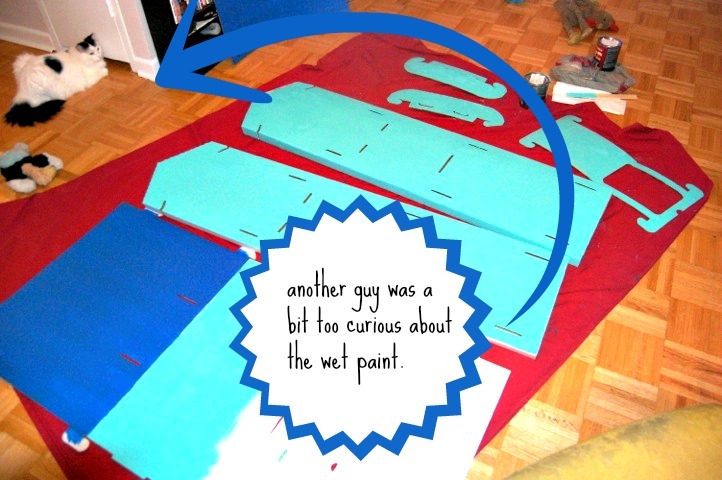 Once the designs start to get more intricate it’s a bit of a pain to constantly wash them out and replace. For snowmen though, it was bliss. Lysol wipes. For those times I drop icing or dough on the floor/counter/sink/Macbook/dog. Water. The kitchen is windowless. It gets hot. I go through litres at a time. Hair ties. See above for the kitchen environment. A Wilton rotating cake stand. I can’t even describe how handy this is for icing a cake. Or even cupcakes. Amazing. Of course making the Olaf ice cream treats meant some magic with chocolate candy melts. We made buttons on the inside of the glass dessert cups (found at Ikea for like $2/4!) and then I drew twig arms on wax paper. I was in a rush/it was crazy hot (I made these the day of the party) so I stored them in the freezer. When you’re icing a Disney princess dress, you realize pretty quick that as pretty as it looks, that hair gets in the way. We had to use elastics to keep everything out of the way (it was fun shoving these in the fridge overnight let me tell you) while we iced. I took the elastics out before serving so they looked perfect on the table. 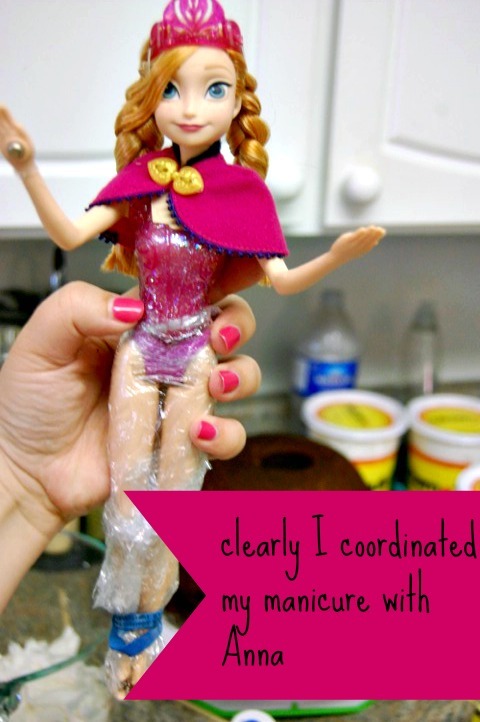 Another pro tip, if you’re shoving a Barbie, particularly one that makes music, in something wet and edible, like a cake, wrap the crap out of the lower half. Nobody will see it and it will save you a major clean up after. I did this with both dolls and we were able to yank them out and dress them (I stored their clothes in a Ziplock and shoved it in my purse) and give them to Lauren to play with while someone else was serving cake, which was perfect. These little guys were actually super easy, despite the three different kinds of sprinkles and gravity defying melted chocolate topper. 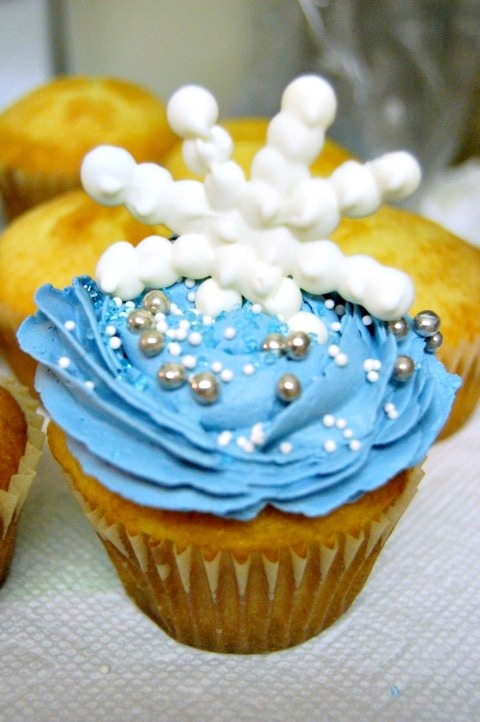 We used left over icing from one of the dresses and used pretty sprinkles to create a wintry look. 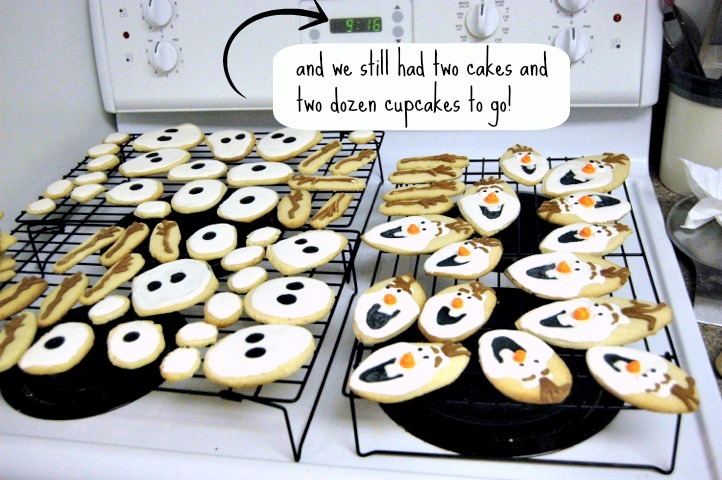 The snowflake toppers were drawn on wax paper and popped in the freezer for 10 minutes, so each one was different. You’ll just note the time here. To be fair we were limited on time, because we had some cake baking catastrophes and I worked until 5 so we got a late start. Still, it made for a stressful evening. The snow cone station was one of the first things we made. It wasn’t edible, so we didn’t have to worry as much about making it “fresh”. We found the stand at Ikea for about $12.99, and it’s all cardboard so it just slides together. It comes with some bold green and white stripes though, so I wanted to cover that. First we bought spray paint, but that was a nightmare. I bought a sparkly silver one (don’t ever do that) and a blue one. The sparkles were a joke, they covered nothing, and the blue can broke halfway through and had barely covered anything anyways. We had dragged it outside to the woods by our apartment because you obvs can’t spray paint indoors. When that failed we had to drag it all back in and store it until we picked up some house paint. I nixed the silver idea here and decided to go with a teal colour. I had to do like 3 coats, which made the cardboard suffer a bit but it was still good. I had a bit of an audience that added some extra stress. You’ll note a few scattered toys in the picture above. I got a little desperate keeping the animals away from the wet paint. 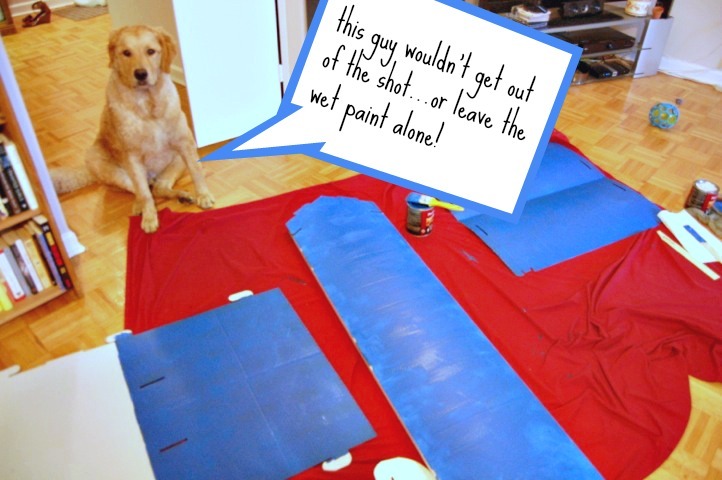 I basically had to watch the paint dry just to keep the pets away. 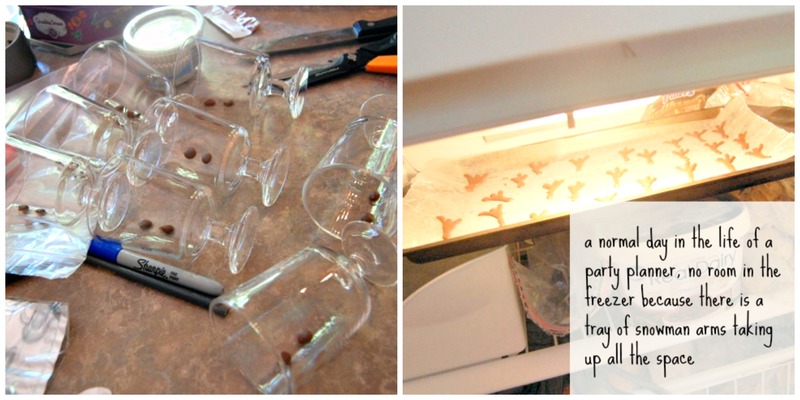 Use a glue gun to attach pom poms to outside of glass. Hold the glass still as the glue dries so gravity doesn’t screw you. Cut a rectangle out of orange felt and fringe the edges. Use a dab of glue at the back and two small dabs to adhere the ends of the scarf in a “X” shape. Pop in a colourful paper straw. Print out snowman top hats and glue to the end of a stir stick. Slide the stir stick into each straw. 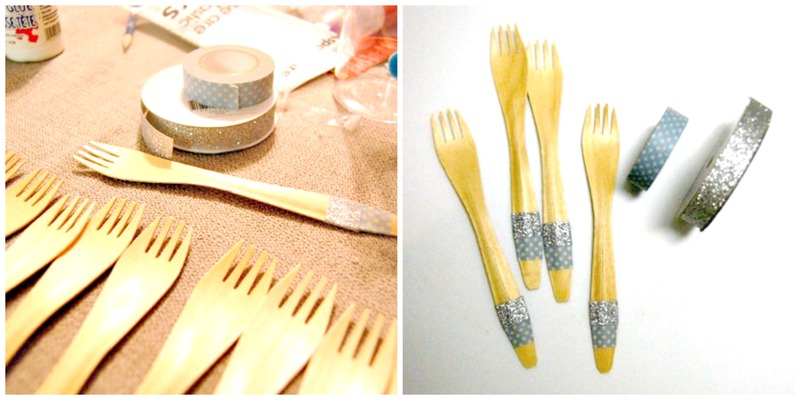 This one isn’t even really a “how to” but more of a “buy wooden cutlery” and use washi tape to make it match your theme. I used blue polka dots and silver glitter tape (yes that’s a real thing) to match the rest of the dessert table decor. So that’s that Party Girls! Sometimes it’s more fun to see the behind the scenes details than it is the actual party, right? I love behind the scenes, it’s like my most favourite kind of blog post.